I'm an unabashed fan of willows. Of course, no tree is perfect and willows have a few pests. Thankfully, the depth of their vital spark means willows are capable of handling the depredations of most pests. However, the pests I'm highlighting can make trees look bad. Canada Thistle in southwest Ohio is starting to show the "ghostly" white symptoms of bacterial infections. The tops of infected plants look like they were dipped in bleach. The bacterium produces a chemical called tagetitoxin which is a RNA polymerase III inhibitor that blocks the production of chloroplasts. Ailanthus Webworm caterpillars feed exclusively on the non-native, highly invasive, misleadingly named Tree of Heaven. 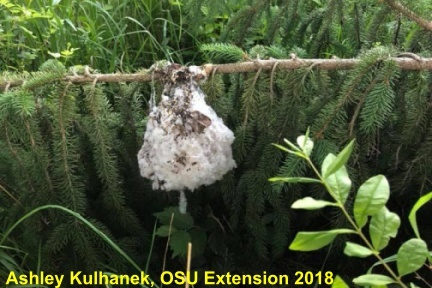 I came across a heavy webworm population this week while lumbering through a thick growth of tree of heaven saplings in search of Spotted Lanternfly. Spotted is native to Southeast Asia. It was first found in North America in eastern Pennsylvania in the fall of 2014. Reports at the time kept noting that Tree of Heaven is the primary host. Frankly, I thought: "Who cares?" Mystery Nest? Don't call 911 just yet! Read more about Mystery Nest? Don't call 911 just yet!